My first summer job was working in a conservation area thats main feature was a large swamp. I cut trails,put up signs and built bridges over the stream that ran through the area. A small boat was provided so visitors could row up the stream as it meandered through the swamp. There one might see the beavers that created and maintained the swamp as well as heron, geese, ducks and other birds. For birds it was an ideal nesting area, having a large food supply of insects and vegetation as well as an abundance of nesting areas among the cattails. The tall cattails covered the majority of the swamp and created a barrier between the stream and the forest edge. Cattails grow anywhere that there is a suitable depth of slow moving water. A very hardy plant which is almost impossible to be rid of except by draining the water in which it grows, it appears to be of little use. Our ancestors however found the cattail to be a bountious plant with many uses. The swamp also provided food and shelter for the early settlers in North America. The game birds were hunted to be sure but the cattails that grow throughout the area were a valuable source of food and raw material. Cattails, rushes , bulrushes, all words used to describe a tall grass like plant that grows in wetlands distinguished in mid summer through fall by the tall central spike that ends in a brown sausage shaped flower and seed pod. The word is an ancient one originating from Sanskrit and is not related to the word meaning to hurry. It appears that wherever people went they used the word to refer to the grasslike plants that grow in swamps or marshes. Bulrush in Britain refers to a reed used to make beehives, thatch and chair seats. 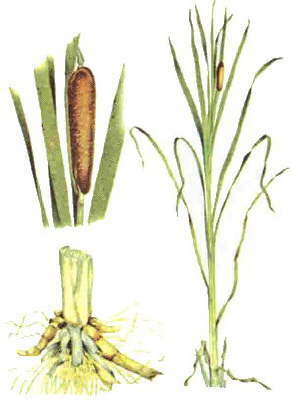 The Biblical bulrush was the papyrus rush. Thus the cattail or American bulrush (Typha latifolia) is distantly related to its Biblical namesake both linguistcally and botanically. When the early settlers arrived in the New World their first problem was to build housing and supply food. Using building techniques they were familiar with they set about building wood frame houses in typical Elizabethan style. The frame was erected and the walls were filled with stones and stucco between the framing. The roof was an open frame that was covered with thatch. Thatch was made from any suitable plant but primarily straw or rush. Some of the sedges found in salt water marshes were suitable as well as the bulrushes of the fresh water marsh. A thatch roof is built by tying bundles of straw or rush first to the wood frame then to each other until it is built up to a thickness of 18" or more. Needless to say this takes a large volume of material and harvesting was a major chore. Although there are no records of the method of harvesting it was likely to be similar to way it is still done. Rush is harvested in the late summer when the plant has reached full maturity but the leaves have not yet felt the effects of the first frost. Usually harvested in small groups several people cut the plants just above the water line and lay them in piles behind them. Using a couple of the long leaves others lash the piles into bundles and haul them out of the marsh. The work is hard as the cutters spend the day bent over and the haulers must carry or drag the bundles out through the mud of the marsh. The bundles are then cut open on one end and the leaves fanned out to dry. If the weather is on your side they are dry enough for use or storage in three days. If not, after the rain, the water is swept or shaken off the leaves and then they are turned repeatedly until both they and the ground have dried out sufficiently. Should the rain last for several days they will begin to rot and the entire crop will be lost. On such occasions we have hauled them into barns and sheds, hanging them from the beams to allow the water to run off. I'm quite certain that our forefathers did the same if the space was available. Anyone who has harvested hay before the advent of modern equipment will recognize the method. As a wild food source the cattail has few equals. When the first European settlers arrived they found the native Americans using the plant for cordage basketry and food. One can't help but surmise that during the first few years, as farm land was being cleared, the cattail helped more than one family survive until the next harvest. In early spring, as the ice leaves the marsh the cattails have already begun to grow below the water, pushing upward toward the sun. This early growth is quite edible either raw or cooked having a flavor similar to cucumber. The reason the cattail gets such an early start is the root or rhizome stores food all summer preparing for the next spring's growth. The rhizome is actually a series of bulbs strung together by roots. The bulbs can be peeled and boiled or dried and ground into flour suitable as substitute for wheat flour. The major importance of the bulbs is they are there all winter when many food sources are nonexistent. As long as the marsh has not frozen solid the rhizomes can be harvested. Lest you think this food source of small consequence an acre of cattail will produce as much as 32 tons of flour. Having supplied shelter and food they promptly set about making their life more comfortable. Having a place to sleep would be of first importance. Once again the cattail can contribute. The soft down like material that is released from the seed pod in the fall is suitable for stuffing pillows and mattresses. It does not wear as well as duck or goose down and would certainly be replaced at the first opportunity. The next thing one might look for is a place to sit. Benches or forms as they are called were easily made but not particularly comfortable having a flat plank seat and no back. So the chair was one of the first luxury items. At hand were the raw materials that were needed to make them, wood and rush. The chairs of the early 17th century were generally turned wood frames with a seat of either a flat board set into the frame or rush. The flat board did not solve the comfort problem and required a cushion. The rush seat on the other hand is reasonably comfortable without a cushion. The dry rush, although quite strong when pulled, is fairly brittle and can be broken if bent. In order to use it for seats it first must be soaked for a day to soften it. To make the seat the leaves are tied to a seat rail and twisted to form a roll. The roll is pulled over the opposite rail, turned around the inside of the chair leg and up over the adjacent rail. This continues with each roll woven through the previous one to form the classic X shape pattern in the top of the seat. When the end of a roll is reached the loose ends are tucked into the bottom of the seat and a new roll started. If you look at the bottom of the seat you'll see the rough clipped ends of each roll. Once the weaving of the seat is completed the space between the top and bottom of the seat is filled with the scrap rush from clipping the ends and the chair set aside for the seat to dry. As it dries the rush shrinks, pulling the seat tight. The seat is then given a light coat of shellac or varnish to protect it from dirt and wear. If varnished periodically the seat will last several generations. Rush and upholstery would be the seat of choice until the Windsor chair became popular in the 18th century. Rush seats would see a revival in the early 19th century as the seat for the fancy or Hitchcock chair. In fact the Hitchcock Co. still makes chairs with natural rush seats. The uses of the cattail hardly stop here. The Pilgrims used the dry leaves as a floor covering to keep out the cold. The fishing industry used the leaves to caulk the barrels in which salted fish was sent back to Britain. The leaves were woven into baskets for a variety of uses. Another type of rush, the soft rush was used for making rush lights. The central core or pith of the plant is soft and absorbant when dry. By simply dipping the pith of this plant in tallow a suitable light can be made which will be as good as that of a candle. A length of rush (about 18") would burn about three quarters of an hour. This simple procedure was used, though apparently not to a great extent in the Colonies, as suitable rush was less plentiful here than in Britain. Hence the betty lamp was the more popular form of lighting in America while in Britain rush lights were in use among commoners well into the 19th century. The cattail is native to all 50 states and it continued to be important as a source of food and raw materials as colonists moved inland. However its use diminished as wood shingles replaced thatch, rugs and floor cloths became affordable and established farms became a more reliable source of food. By the early 19th century its only major use was for chair seats and so it remains today. But driving by a marsh with the cattails waving in the breeze I can't help but remember what a resource this was to our forefathers.